This phrase reflects a universal longing. But our world is addicted to ever more deadly war. How will the promise of peace really be fulfilled? The irony was hard to miss, even for nonreligious people. Here was a militaristic, atheistic global power, bringing to the world a peace gift inspired by—of all things—the Bible. 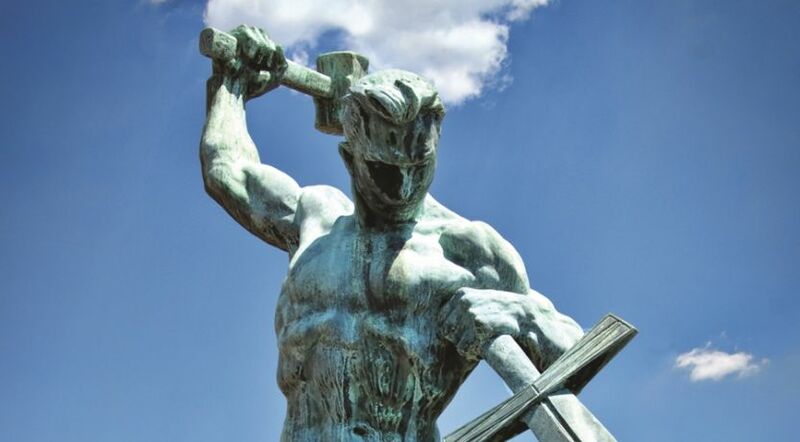 It was 1959 when the Soviet Union presented to the United Nations a bronze statue of a brawny man wielding a hammer. With it, he was reshaping a weapon representing war and destruction, a sword, into a tool suggesting peace and goodness, a plow. Coming from a regime that disdained the Bible, persecuted the religious and had recently slaughtered millions of its own citizens, Russia’s gesture rang hollow. But the words on this famous statue, “We Shall Beat Our Swords Into Plowshares,” strongly resonated in the hearts of people around the world, as they do to this day. When accepting this gift, then Secretary-General Dag Hammarskjöld declared that “the ancient dream of mankind, reflected in the words of Isaiah,” was the same dream that had inspired the creation of the U.N.
World statesmen often quote this verse in speeches. Musicians set it to songs ranging from the stirring finale in Les Miserables to Michael Jackson’s “Heal the World.” And anyone who reads it can identify with it: “That’s the world I want!” Isaiah’s words beautifully encapsulate a universal longing. Is the truth as fatalistic as Cormac McCarthy portrayed it in his novel Blood Meridian? “It makes no difference what men think of war. … War endures. As well ask men what they think of stone. War was always here. Before man was, war waited for him. The ultimate trade awaiting its ultimate practitioner. That is the way it was and will be” (1985). Given our history, it seems to many that he’s right. Man stumbled upon violence accidentally, biblical history shows, and it didn’t take us long! Adam and Eve’s son Cain, in a fit of jealousy, “rose up against Abel his brother and killed him.” Whatever he used—a rock, a limb, his fists?—Cain ignited humanity’s most dreadful plague, people rising up and killing one another. His wickedness stemmed from an emotional outburst, but those who followed quickly began studiously perfecting the art of war, devising the most efficient, destructive means possible. And painful and repulsive as war is, we remain stumped in our quest to perfect the art of peace. Lawrence LeShan is on to something, though, when he notes in his book The Psychology of War: Comprehending Its Mystique and Its Madness: “We must not ask, ‘What events led to the outbreak of this war or that one?’, but rather, ‘What is there in man that makes him so ready to go to war, in almost all cultures or economic conditions?’ The question we are dealing with here concerns the readiness, the receptivity, the seed-bed on which specific events fall and which, when nourished by it, flower into armed intergroup conflict” (2002, p. 109). It’s clear to most people that the “seed-bed” of human thinking has to change. But how? We come so close to the answer in Isaiah’s words etched on the wall near the U.N., but we miss it by a mile when we fail to read the rest of what he wrote. Those statues and songs rush to portray the beautiful end result of Isaiah’s ideal world, but they neglect to consider what precedes it. Only in the rest of Isaiah’s words do we see the backstory that is crucial to understanding what will lead to walking away from war. Isaiah begins by establishing the setting in which the only possibility of a warless world can take place: “Now it shall come to pass in the latter days that the mountain [government, in prophetic terms] of the Lord’s house shall be established on the top of the mountains [other human governments], and shall be exalted above the hills; and all nations shall flow to it” (Isaiah 2:2). Fact one: World peace will never happen without Jesus Christ coming to the earth to establish the Kingdom of God over which He will reign as King of Kings. Bible prophecies center squarely on that event. Jesus warned that we will eventually teeter on the verge of destroying ourselves, but He won’t let that happen (Matthew 24:21-22). What next, though? After He returns, people all over the world will say, “He will teach us His ways, and we shall walk in His paths.” What prompts this turning to God? “For out of Zion shall go forth the law, and the word of the Lord from Jerusalem” (Isaiah 2:3). The little word “for” is quite important. It means “because” or as a consequence. Fact two: The desire people have to learn from God arises because His law and word first go forth. The knowledge He gives stirs in them a longing to learn more. Finally they’re grasping how the “seed-bed” of human thinking works and why it can be so destructive. Notice the beginning of verse 4, which is omitted from most artistic depictions of the “swords into plowshares” concept! “He shall judge between the nations, and shall rebuke many people.” This is a key statement—what is it telling us? Fact three: Turning from war comes because of being judged and rebuked! God’s judgment here is not sentencing people to their fate. It is judgment clearly designed to help people comprehend their need to correct their futile, humanly devised ways, laws, paths and thoughts. Along with judgment inevitably comes being “rebuked,” or convicted, convinced, corrected. Surely common sense tells us that something about the way we live desperately needs to be corrected! By the nature of this process, the “swords into plowshares” scenario cannot happen overnight. People won’t immediately reject war when Christ returns, because they will first have to reject their way of thinking—the only way they’ve ever known. Rejecting one way of thinking depends on replacing it entirely with another. War will only be rejected when a new way is accepted—God’s ways, His laws, His thoughts. But He tells us, through Isaiah, it will happen! Beating swords into plowshares is a wonderful metaphor describing a widespread physical response that will spring from a spiritual understanding. If we want world peace, we cannot exclude these spiritual prerequisites. We can’t erect statues and etch upon them partial sections of verse—but exclude the principles we must follow to find peace! Pretending we can make it happen without Christ returning and totally reshaping the way we think is delusional, if not self-righteous. Centuries after Isaiah, another biblical writer elaborated further. The apostle James posed in the simplest of terms a core question all humans need to face: “Where do wars and fights come from among you?” (James 4:1). We tend, as LeShan noted, to answer with various events that trigger wars. But James went straight to the heart of the matter—each person’s heart. Desire (or lust, as it’s also rendered) means that which pleases the senses, or suits one’s desire or pleasure. It includes the things that commonly motivate us, such as power, glory, position, wealth, dominance or simply just wanting our own way. All of these spring from self-centeredness. These things light the fuses of the worst human behavior. James continues to describe the war in the mind: “You lust and do not have. You murder and covet and cannot obtain. You fight and war. Yet you do not have because you do not ask. You ask and do not receive, because you ask amiss, that you may spend it on your pleasures” (verses 2-3). His point is simple: War is born from personal or national self-seeking, self-interest, self-aggrandizement. Until the self is conquered, war remains unconquered. Even asking things from others or from God is commonly selfish. How many wars have originated in religion, with all involved beseeching favor from God as the combatants kill one another? God will never answer when the spirit and motive are so wrong! Based on humanity’s track record, the answer is no. We don’t know how and why the world’s way is enmity with God. Fighting and warring on any level—in marriage and family, with neighbors, or among nations—follows the way of an ungodly world, not God. It stems from problems in the human heart, spiritual problems. And spiritual problems are rooted in rejecting God’s way of life. James continually steers us back to this truth, never letting us excuse our way out of it. Conflicts may be acted out between humans, but the root problem is that we have first rejected God! The solution is simple, though not easy for humans: “Submit to God,” “draw near to God,” “cleanse your hands” (repent and change), “purify your hearts, you double-minded” (verses 7-8). “Lament and mourn and weep,” meaning to genuinely be sorrowful, and “humble yourselves in the sight of the Lord” (verses 9-10). So, is James too simplistic, or do his words simply cut to the heart of the matter? Actually, these are words inspired by God, and God is clear: Wars between people will cease only when we first end our war with Him! When Christ returns, He will convince people that “the problem is not between you and this person or your nation and that one—the problem is between you and Me!” He will require each of us to confront the reality of our own nature—the self-centeredness that generates all that is wrong in our actions. And as each of us accepts God’s righteous sovereignty, humbly seeks His forgiveness and help, changes the thoughts and intents of our hearts, and starts obeying His laws—the things that make for peace with our Creator—then we will finally find our way to making peace with our fellow man. Can we stop war and fighting now, on a worldwide basis? No. Christ must return; God’s Kingdom must come—and that’s the first thing Jesus told us to pray for (Matthew 6:10). But can we live the way of peace on an individual basis? Yes! The second thing He said to pray for was, “Your will be done on earth as it is in heaven.” You have the opportunity now to choose to learn and do God’s will. You can understand His will and His way; you can turn away from self-will; and you can make peace with Him—if you are willing!